According to the National Sunflower Association (yes, there is one! 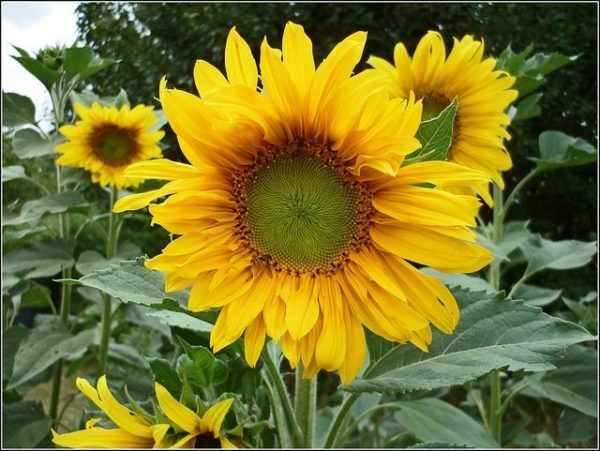 ), the wild sunflower is native to North America, but commercialization took place in Russia. It's only recently that the plant has become a widely cultivated crop here in our home country. The American Indians, however, first domesticated it into a single-headed plant with a variety of seed colors. Today, the sunflower signifies warmth and happiness, and comes in a number of varieties from small to large and from daylight yellow to sunset red. The seeds are great for a healthy snack, and also make great extracts and oils for use in skin care. It's bright, cheery, and great for your skin! The sunflower (Helianthus annuus) was cultivated by American Indian tribes as far back as 3,000 B.C., with some archaeologists suggesting it may have been domesticated before corn. Tribes used the seeds to eat, make oil, and ground into flour. Parts of the plant were also used to help soothe snakebites and to condition the skin and hair. Spanish explorers took the plant to Europe around 1500, and by 1716, an English patent was granted for squeezing oil from the seed. Initially the sunflower was mostly used as an ornamental, but by 1769 populations were cultivating it for the oil. By 1830, the manufacturing of sunflower oil was being done on a commercial scale. By the early 19th century, Russian farmers were growing over 2 million acres of it—and it gradually came back to the U.S., probably because of Russian immigrants. The first commercial use of the sunflower seed in the U.S. was as feed for poultry. It wasn't until the early 1900s, however, that we first started processing the oil. Sunflower seeds are a great source of vitamin E, vitamin B1, manganese, copper, tryptophan, magnesium, selenium, vitamin B6, phosphorus, and folate. Since vitamin E is the body's primary fat-soluble antioxidant, sunflower seeds, seed oil, and seed extracts help deter free radical damage that can contribute to aging, as well as providing significant anti-inflammatory benefits that may help reduce the risk of arthritis, and heart disease. Sunflower also contains other polyphenol compounds that work as natural antioxidants, including chlorgenic acid, quinic acid, and caffeic acids. Sunflower seeds also have phytosterols that may help reduce human cholesterol levels. A study from the Pennsylvania State University found that substituting two tablespoons per day of sunflower oil for saturated fat significantly lowered total cholesterol by nearly 5 percent, and LDL “bad” cholesterol by nearly 6 percent. A recent study appearing in the British Medical Journal also found that eating foods fried in olive or sunflower oils were not linked to heart disease or premature death. Sunflowers are also believed to contribute to healthy bones, because of the magnesium content. Vitamin E in sunflower seed oil is crucial in protecting the skin from environmental stressors. Vitamin E can also help smooth the appearance of wrinkles. Sunflower is also a good source of beta-carotene. Sunflower seed oil contains essential fatty acids—including linoleic, oleic, palmitic, and steraric acids—which are perfect for tightening and firming your look, promoting skin that has a soft, smooth appearance. Many people with sensitive skin also swear by warm soaks in sunflower oil baths. Finally, sunflower seed oils can help moisturize the skin, smoothing the appearance of fine lines and wrinkles. If you want to enjoy the benefits of sunflower seed oil and extract, try the following products. Each one includes only the highest quality sunflower ingredients. Do you know of other uses for edelweiss? Please let us know! Photo courtesy pete from camberwell via Flickr.com. “All About Sunflower,” National Sunflower Association, http://www.sunflowernsa.com/all-about/history/. “Sunflower Oil Found Better for Lowering Cholesterol,” Prepared Foods, August 8, 2005, http://www.preparedfoods.com/articles/sunflower-oil-found-better-for-lowering-cholesterol.